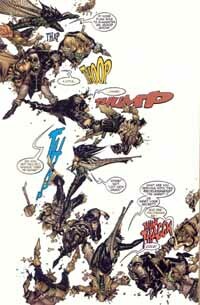 Chris Bachalo: Dust Was My Kryptonite! �My words in Greek. Very cool!!�. That was the beginning of Chris Bachalo's reply e-mail to our interview query. Chris' humor was evident throughout the whole interview and it was, without a doubt, a pleasant surprise. Enjoy this exclusive interview with the man who became a comics artist because... he was allergic to dust! Comicdom: First of all, how did it all start? 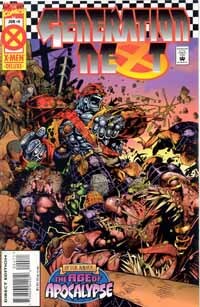 What was the beginning of your relationship with comics? Were you a comics reader as a child? 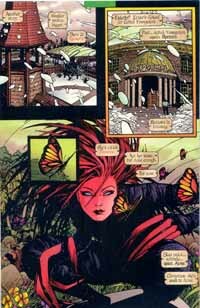 Chris Bachalo: It all started out of desperation. I was ten. My parents were about to squeeze my sister and me in the back of an El Camino for three days as they drove from Canada to our home in California and I was in a drug store looking for something to kill the time. Candy is good for the first half hour but then it's gone and you have to deal with a sugar high in a confined space. God interfered and pointed me to a comic book rack, loaded with monster comics. When you're 10, monsters are great escapist material. I was saved. I pulled a copy of SWAMP THING and MAN-THING from the turn style and was on my way. CD: When did you discover that you wanted to be a comics penciller? Did you have any formal training? CB: I was desperate, again. I'm 15. I'm in High school. I'm a reclusive dweeb and I'm sitting there wondering what the hell am I going to do with the rest of my life. I had just finished a program at school designed to inspire us pimply faced creatures to start considering what the hell we were going to do with the rest of our life and I was feeling disillusioned with the program's recommended occupation, that being a carpenter. Only, there were no questions on the forms that we filled out inquiring as to what we were deathly allergic to. Dust was my kryptonite, so I was going to either sand bookshelves in a space suit or find something else to do. I also had a very low tolerance for direction and was reclusive, as I mentioned before, so selling toasters or being the next Charlton Heston wasn't going to fly. What do I like? Monsters. Comics. Stories. God knows why, I always had a good eye for art. I couldn't draw a coconut, but I sure can tell the difference between a well drawn coconut and a poorly drawn coconut. And I liked movies and reading Hardy Boys books. I'll be a comic book artist! I took classes in High school and quickly realized that this was for me. My average GPA quickly became an above average GPA, I was the teachers pet and won an award for achievement. I could see the space suit fading from the future. I moved on to University, graduated, and sent examples of my work to everyone that was publishing comics 1989, and was rejected by everyone that was publishing comics in 1989. CD: What was your first professional comics work? 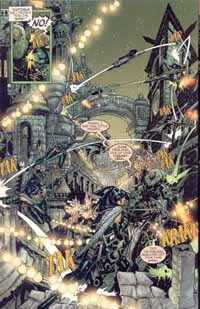 CB: Six months later DC Comics sniffed me out to see what I was up to. I sent in my new work and I received a phone call from Karen Berger's husband, Richard Bruning, Director of Submissions. "How would you like to try out for a new book called SHADE THE CHANGING MAN?" "Um, Okay!!" I passed. SHADE issue one was still being written. 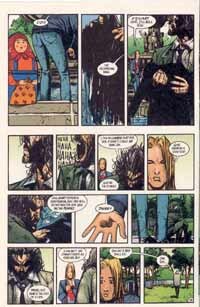 Another call, "How would you like to do a fill in on SANDMAN #12?" "SANDMAN? The coolest book on earth?!! Um, Okay?" My first pro work! CD: How did you get the DEATH: THE HIGH COST OF LIVING gig? I mean, a relatively unknown artist collaborating with Neil Gaiman? 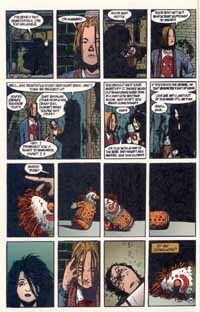 CB: At the time, Neil was still pretty new, SANDMAN was still finding an audience and I had been working on SHADE for two years when the call came. "How would you like to draw DEATH: THE HIGH COST OF LIVING with Neil?" "Death? The coolest character on Earth? With Neil? The coolest writer on earth? Um, Okay?" CD: About GENERATION X. Did you enjoy working at the title and the characters? In your last few issues, it looked as if you were getting a bit tired of doing it. CB: GEN X was a dream job. 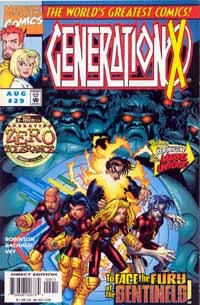 Scott (Lobdell) and I created the characters and the storyline and it was pure fun. The industry was thriving, we were in the Top 10 sales chart each month, making crazy money -at least more than a carpenter, but not more than, say, Elton John- and we could do almost anything we wanted. The glamour began to wear off when Scott left, and the industry began its slide back into reality. I'm not one to sit still, so I'm constantly trying to evolve my style and I feel that my work slid into a poor Manga rip off. That, and I was falling behind on deadlines and found myself drawing issues too fast. Marvel experimented with shooting directly from my pencils, we had new inkers, a new writer, different printing processes and the company was sliding into bankruptcy. It was chaotic. A monstrous situation. The book's quality suffered. It probably looked tired too. CD: Do you have any dream projects in mind? Something you keep saying "I'm gonna do this someday" but you never get the time, or the opportunity. CB: Yes, and I found the time. After a year on UNCANNY X-MEN, I worked on two such dream projects, STEAMPUNK at Cliffhanger and WITCHING HOUR at Vertigo. CD: Are there any particular corporate-owned characters you wish to draw and haven't had the chance to do so yet? CB: I feel that I may have a good take on Spider-Man or Teen Titans, the Wolfman/Perez line up. Oh yeah, Batman too. CD: Any writers you'd give anything to collaborate with? CB: No, anything is a lot and I've worked with most of the best, but I enjoy (Mark) Millar's work, the best in the biz at this time, or maybe (Garth) Ennis. It would be a pleasure to work with (Jeph) Loeb again. He was amazing on WITCHING HOUR. CB: Yes! AoA! March 2005! Check it out!! It's great fun. CD: What's your opinion, as a reader, about mainstream comics today? CB: Like everything else produced by humans, I feel that 80% of it is a waste of time, 10% is tolerable, 9% is good and 1% is amazing! This means, that of the 300 books published each month, about 10-30 are worth buying. CD: How do you feel about comics as an industry at the moment? Things don't seem to be going very well commercially. CB: Man, don't get me started. I don't buy it. I think it's amazing top to bottom. This industry, today, cannot compare to what I had available to me back in '75 when I pulled those beat-up monster books off of the turn style. Geez, I'm doing an interview on-line about my work for a publication in Greece, 75,000 people attend San Diego comic con. I can chat with creators via e-mail, buy a cool bust of my favorite hero, heck, buy ANYTHING ever published or produced on-line, watch X2 -an amazing movie- over and over and over and it's all out there. It's beautiful. The industry is solid. We have, what feels like, a gazillion well-published books to choose from each month with quality printing and a wide range of genres from around the world. I, for one, can't keep track of them all. Would it be nice to sell a million copies of each title and get filthy rich with mansions on the hill with views of the pacific? Yes, but lets not kid ourselves. The comics industry will never be as big as the movie or video game industry. It is what it is, a medium-sized business with a passionate following. And that's okay. It's been around for 60+ years and I don't see it going away any time soon. CD: What are your future plans? What will you be working on in 2005? CB: I have AoA being published early this year and I hope to write my next series. I have a proposal in the works. It's very cool. Stay tuned. CD: That's all for now. I really wanted to ask you a lot more things but I understand that your time must be pretty limited. I want to thank you from my heart for that interview and I wish you creativity and prosperity.